The state of Virginia is stepping up to the plate with its latest plan to reach Bay pollution reduction goals by 2025. On Friday, Governor Ralph Northam released a draft of the third phase of Virginia’s watershed implementation plan. Every state in the Chesapeake Bay watershed (and Washington, D.C.) has specific pollution goals— limits on how much nitrogen, phosphorus and sediment should go into the water. And each must come up with a strategy for limiting those pollutants, called a Watershed Implementation Plan. 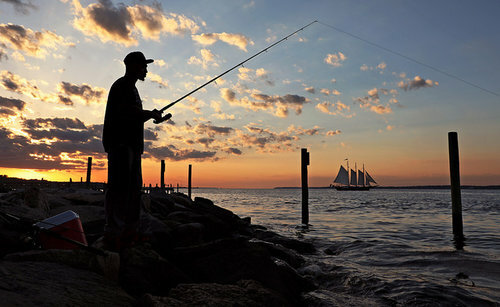 The state limits are part of the Chesapeake Bay’s overall “pollution diet,” the Total Maximum Daily Load (TMDL) of nutrients and sediment allowed into the water. If the Bay can stick to its diet, water quality standards will be within reach. The EPA’s Chesapeake Bay Program is overseeing the effort to put the TMDL into place by a 2025 deadline. The Bay Program partnership coordinates federal, state and local governments to develop Watershed Implementation Plans. These will guide Bay restoration efforts through the next decade, at least. Virginia’s latest draft plan tasks government, wastewater utilities, the agriculture industry, landowners and homeowners, lawn care companies, and the general public with taking significant action to reduce pollution ahead of the deadline. Virginia’s newest draft is notable because it’s the first state to factor climate change into the equation. “Virginia is leading the way in this proposal by accounting for pollution increases due to climate change, which is already harming the Chesapeake Bay and is expected to worsen. It’s essential that we proactively address major threats from climate change right now to ensure healthy waterways for future generations,” says CBF Virginia Executive Director Rebecca Tomazin. The draft plan is open for public comment through June 7 before it is finalized. The Northam administration will also offer two webinars on May 13 to share information about the draft, the comment submittal process, and to answer questions from the public. To read the draft, submit a comment, or register for one of the webinars, click here.